Do it yourself, change the brake light switch on your Ford Explorer, the model made between the years 1998 and 2006. The replacement procedure is very easy. You won’t require tools, maybe a flat headed screwdriver in some cases. You should be able to make this replacement in less than 15 minutes. In the beginning, open the front door, on the driver’s side. 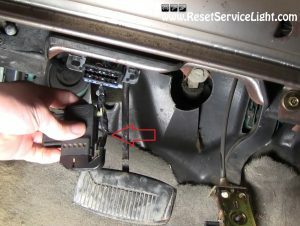 Then you will have to get underneath the dash and the steering-wheel and remove the safety clip that holds the brake switch, as you can see in the picture below. If you find it easier, first you can remove the lower trim panel. It has four screws and can be detached easily. But only if you consider it can help you in the replacement process. After you remove that yellow clip, using your thumb, you can grab the brake switch and work it back and forth and to the left, until it comes out of its holding rod. 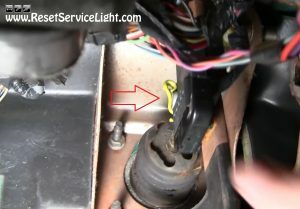 The last step is to disconnect the electrical harness seen in the image below and remove the brake light switch completely. Now you can install the replacement, plug back that electrical harness and place the new switch in its place, as the old one. Secure it with that safety clip and you should be ready to go. This is all you have to do, if you need to remove and replace the brake light switch on your Ford Explorer, produced between the years 1998 and 2006.